Thousands of persons participated in a mass hunger strike in Assam on Tuesday to protest against the Citizenship (Amendment) Bill 2016. The protest at the Assam Engineering College ground in Chandmari area was led by the All Assam Students Union and supported by at least 28 other organisations, including the Asom Gana Parishad, a partner of the BJP-led government in Assam, and the Congress. “Assam is not a dumping ground. We have registered our protests against the bill several times. We will not accept it at any cost,” AASU Adviser Samujjal Bhattacharyya said while addressing the gathering at the protest site. 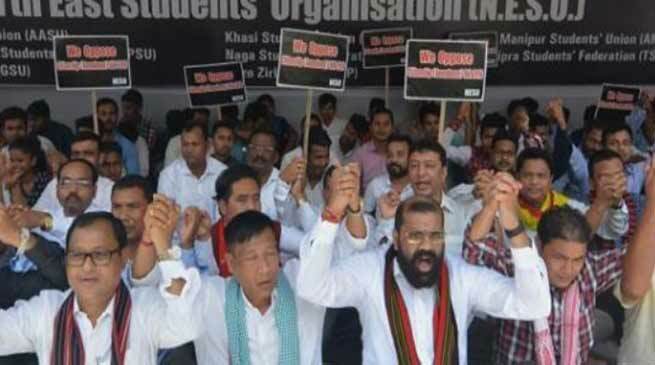 Protests have become the order of the day in Assam since a Joint Parliamentary Committee on the Citizenship (Amendment) Bill 2016 visited the state this month. “The infiltration from Bangladesh has impacted the demographics in Assam. The central and Assam governments must respect the Assam Accord, which clearly said that the cut-off date for identification and deportation of Bangladeshis is the midnight of 24 March, 1971,” Bhattacharyya said and warned of a massive agitation in case the Centre and state went ahead with the passage and implementation of the bill.